Sleeping on the stomach is one of the most popular choices for men and women alike, then is side sleepers. As comfortable as sleeping on the stomach can be, it presents a few hazards that you should be aware of in order to prevent several annoying health issues and chronic pain that can last all day long. Lying on the stomach can cause lower back pain, pinched nerves in the shoulders and neck, and daily pain that radiates all the way down to the buttocks and legs. Some of the health issues that beset stomach sleepers include heartburn and indigestion. It surprises some people to know that almost all of the problems caused by stomach sleeping can be alleviated by choosing the right pillow for the stomach sleeper. Proper support can help prevent back pain, muscle cramps, and nerve damage, and take the pressure off of the digestive system as you sleep. We have just written article about best pillow for side sleepers, you can learn more about them. Even with this reality, picking the right pillow has not always been easy for many people because of the fast rising number of brands and designs on the market. Well, this need not be the case anymore. We reviewed, tested, and analyzed pillows and brought you top pillows for stomach sleepers for your consideration. Our review team guarantees you that these pillows will make you comfortable and assist you to fall asleep fast and enjoy it the entire night. With them, you will wake up more refreshed, energized, and free from pain and fatigue. We also list for you all the advantage and disadvantages of each pillow so that you can make the best choice, enjoy every night, and live a more productive lifestyle. The Extra Soft Down Pillow is the softest, fluffy pillow for stomach sleepers from the market. 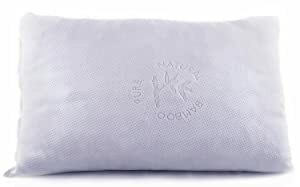 This pillow uses 80% of high-quality Down and 20% of white goose feather, promoting the most luxurious and comfortable feeling for face sleepers and stomach sleepers. Using material-standard five-star hotels, this Down Pillow is hypoallergenic and machine washable too. 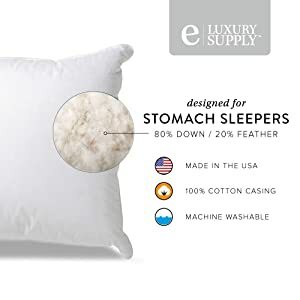 The Extra Soft Down Pillow out-stands other pillows for stomach sleeper by its dedicated softness, but this Extra Soft Down Pillow is one of the best pillows for sleeping on your stomach. Besides, the standard side is a bit small to some people. We rate this product 8.5/10. The Pancake is one of the most popular pillows on the market. It’s great for side, back, and stomach sleepers as it can be customized to meet your unique needs. Do you feel like adding a bit of “extra layer” tonight or aren’t sure whether you will feel comfortable sleeping on a really slim pillow? The amazing thing about the Pancake Pillow is that you can add or remove its layers as you please. It features six incredibly soft layers with microfiber filling. The case that comes with the piece is made from the finest quality 300 thread count cotton. According to the reviews, people love this product because it’s incredibly versatile; a lot of families love it! Anything people didn’t like about the Pancake pillow? Well, some people noted that they don’t like that the layers are so soft. Some people complained that your head sinks in too far. If this bothers you, try experimenting with the number of layers until you find the perfect combination for you personally. 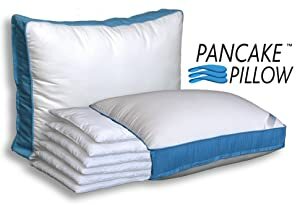 Customer’s satisfaction about the pancake pillow is awesome because the people have used it and they are much impressed, especially in various sleeping positions. Secondly, this pillow has an interesting specification history that motivates the customers. Almost 88% customers give it a good score up to 5 stars. DC Labs, a renowned leader among the bedding makers claims that the Ultra Slim Sleeper is the thinnest pillow you can find. It’s hard to argue with this as the item is only 2 inches thick. That definitely makes it one of the best products for tummy sleepers. Your head sinks into it, so the pillow gets even thinner, which means that the curvature of your neck is minimal. The foam conforms to the shape of your face perfectly, so you will feel comfortable and your neck wouldn’t give you any trouble for sleeping on your front. The foam used by DC Labs is of the highest quality and offers the additional benefits of resistance to bacteria and bed bugs. The material is hypoallergenic and safe for anyone to use. A great number of reviewers claim that it’s the top rated option for those who prefer to sleep on their front or with an arm under the pillow. People also like that the piece is easy to care for as it’s machine-washable. Any negative marks? Some of the reviewers complain that the product is too soft so that once you lie down, your face is only about an inch above the mattress. However, this is exactly what makes it the best choice for stomach sleepers who don’t want to have a sore neck! Memory foam with many qualities like hypoallergenic, anti-microbial and bed bug resistant etc. Less comfortable than thicker and traditional pillows etc. When you put your eyes over the score made by this slim memory foam pillow on Amazon, then, in fact, you will find it the best purchase with high score. However, there are not too many people who have used it yet. While, many customers read its specs and qualities, but they do not have their access to this glorious product, as it is limited to few countries only. The Slim Sleeper is designed specifically for stomach sleepers. According to its maker, it will also suit those who sleep on their backs or sides. Natural latex is a hypoallergenic material resistant to mildew, bacteria, fungi, microbes, and dust mites. The foam features a pinhole design that increases its breath-ability and prevents you from getting too hot even in the middle of the summer. The item is medium-firm and 2.75 inches thick. So, if you sleep on your front, you won’t have a sore neck upon waking, and your face won’t be too close to the mattress. The best quality of this product is that the Slim Sleeper is hard, but not too hard, according to the vast majority of reviewers. Drawbacks? Some people claim that the item is a bit firmer that they are used to, but they also say you get used to it rather fast. Therefore, you will just need to ‘break the pillow in’ before you can enjoy it thoroughly. The Shredded Memory Foam Pillow helps you create the perfect bedroom sanctuary. It has all of the attributes that make it both aesthetically pleasing while it supports your body so you can sleep comfortably. Many times, people ignore the importance of a good support system for their head and neck. Buyers often spend a lot of time deciding on the perfect mattress, then wonder why they still ache when they get up or feel tired even after sleeping all night. The answer is simple, your pillow has as much, and sometimes even more, influence on how well your body can relax while you sleep, and can either aggravate or relieve muscle tension. The Supportive Foam Reduces Sleep Restlessness: The comfortable support of the Memory Foam Pillow lets you sleep soundly without the need to change position throughout the night. Plush Support that is Perfect for Side Sleepers: The thick, plush support of this heavy-duty pillow is great for side and stomach sleepers. Side sleepers, in particular, have a hard time finding a pillow that can truly support their neck and shoulders. The Good Life Essentials Memory Foam Pillow lets you sleep without worry and wake up feeling pain-free. Easily Adjusted for Personal Preference: Unlike a solid foam pillow, the shredded foam insides mean you can mold the pillow easily to your personal desires. Large Size for Easy Body Conforming: This pillow is available in 3 sizes (standard, queen, and king), but each one is a very large and generous pillow for its category. The extra large pillow lets you use it to support your back, stomach or sides while sleeping as well as for a head/neck pillow. Through 5 Year Warranty: Good Life Essentials provides a very generous 5-year warranty for your satisfaction. If for any reason, mechanical or simple preference, you are not satisfied you can get your money back. Has a Learning Curve: Few pillows can be said to require education, but shredded memory foam pillows are not something many people know enough about to begin using them immediately. The educational needs are not difficult, but it is important for users to understand there will be things they need to know, so they do not jump to conclusions. For instance, these pillows may have an odor when they are first unpacked. That can be an immediate turn-off to people who do not know this is normal and that they pillows need a few hours to air out. The way shredded foam pillows feel can be unusual at first as well. It takes a little getting used to, but the plush comfort they provide makes it worth the time it takes to get used to the new feel. Thick Cushion Doesn’t Flatten Out: This is not technically a disadvantage. It isn’t supposed to flatten out, and most people don’t want a pillow that gets flat. That’s the whole idea behind memory foam. However, there are times when someone might want less cushion, especially when sleeping on the stomach, and this pillow may offer too much cushioning in that situation. 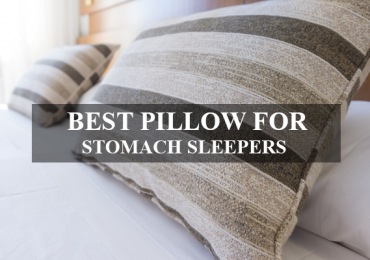 Types of pillows for stomach sleepers: There are a lot of pillows to choose from to ease the pressure on your stomach and avoid risks. Types of pillows differ from the material used to manufacture pillows to the level of comfort and finally down to the price. Foam pillow: Foam pillows are the most common pillows available in the market for people who sleep on their stomachs. It is soft, easy to maintain and is cheap too. Foam also easily molds to your body and depending on the density, will be able to support important parts of the body like the neck, head, spine and pressure points found on the upper and lower extremities. However, as the foam is easy to use and versatile, it could easily lose its shape when used over time. Therefore if you are looking for long term comfort, a foam pillow may do well but not for long. Latex pillows: Latex pillows are firm and could easily support different body parts. Comparing different kinds of pillows to latex, it is a pillow that can resist mold growth and dust mites. The foam itself is very easy to contour making it ideal to use in any kind of support. Wool and cotton pillows: Are traditional types of pillows that are easy to use and are very easy to purchase too. However wool and cotton become packed or firm when used after a period of time making it inefficient to provide comfort and protection over a particular body part. Your pillow gets firmer and firmer and becomes more uncomfortable as time goes by. Feathers: A pillow made of downy feathers is also a traditional way to support the body as it sleeps. The best parts of using downy feathers as a pillow are that you can easily move the stuffing around when you need to and you can rest assured that aches and pains will be reduced since downy feather pillows are soft and firm and is able to provide the best support when you need it. Decide which pillow is the best for you. Consider the level of comfort, the ease of use and the durability of the material. Therefore considering all the following elements, the memory foam mattress may be the best choice for you. Do not worry about choosing other types of pillows; remember that it is a personal choice but of course, you could still improve your experience by selecting the ideal pillow. Check out the various brands for the type of pillow you chose. There are a lot of different brands to choose from and if you have a budget in mind, you may compare brands to get the best value out of your money. Once you have managed to find a brand to purchase, try to look for this brand in an actual store. If possible, try to feel each brand. Fluff the pillow to arrange the fibers and material; hug it, lie down on it and try to place it on your stomach. Decide which brand provides you with the most comfortable feel as you lie down on your stomach. Reviews from on-line sources about the pillow for stomach sleepers may also help. Read as many reviews about the brand and the type of pillow you have chosen and then compare them with other brands as well. Read comparison sites too. Making a decision could be tough and even after a very long process, you may still end up with a pillow that is not to your liking. As they say, trial and error improve your choices so if you found out that you are not comfortable with your choice then, by all means, go for the next best one. Is your tight budget an issue? By comparing products and ordering them directly, you can save a lot of money. So be sure to compare products beforehand and to order only from manufacturers if possible. Shopping on-line could be tricky especially when you are looking for a stomach sleeper pillow. It is a great idea to watch videos and read articles first so you can find the most suitable pillow to match your needs. If you are shopping for pregnancy pillows then it is a must to get the safest and the most comfortable pillow at all cost. As always, reviews will help you find the right product easily. And shopping for a good pillow for a young child should always have safety as the most important feature. Pick one that may be easily washed and one that has removable color so you can wash it immediately after being soiled. Who needs to sleep on their stomachs? Sleeping on your stomach is relaxing and comfortable and if the right pillow is used, he will be able to enjoy the benefits of this comfortable sleeping position. Young children may find sleeping on their tummies more comfortable and soothing. Growing children need adequate sleep each day to be able to develop intellectually and physically. Sleeping on their stomachs could also reduce gastrointestinal disorders like gas, cramping, abdominal pains and so on. Adults could benefit from sleeping on their stomachs since it is very soothing and relaxing. Just like yoga, sleeping with your stomach straightens the spine and helps ease pains that may result from the shoulders, hips and the extremities. And not only young children need adequate sleep. Adults also need ample time to sleep and to relax to help reduce aches and pains and to improve digestion. Pregnant women are also advised to take enough sleep to help ease on various complaints such as back pains, digestive problems, and pains over the extremities. Lying on the stomach when she is just on her first and second trimesters could be easy but once the mother is in her third-trimester things become a little bit hard. Therefore instead of advising women to lie on their stomachs during their term, she is told to simply lie down on her right side to ease contractions and to reduce pains as well. Women suffering from the effect of menopause may find lying on the stomachs better compared to simply sleeping in traditional positions. It eases symptoms such as anxiety, gastrointestinal symptoms, and pains. Who could benefit from these products? People who naturally love to sleep on their stomachs will benefit from these products. And of course, people who are trying out this sleeping position for the first time will do so as well. Young and old alike will be able to benefit so much from these pillows and of course, consumers will get the best value for their money and ease on spending on unnecessary items that will never give them a good night’s sleep. A good night’s sleep is a great way to start any day. It helps the body recuperate and improve digestion. And what better way to improve your sleep than to sleep in the most comfortable sleeping position with the aid of the best sleeping companions: stomach sleeper pillows. And therefore even if you are young, a young adult or a young at heart, there is no excuse for using the best pillow for sleeping on your stomach. There are a lot of types to choose from; choose the type of pillow that will address your needs. And when you are done, it’s time to sleep on your stomach along with the most comfortable pillow you have personally chosen for yourself. Good night! If you can not find a pillow in the list above, you can search for other pillow at nymag.com .